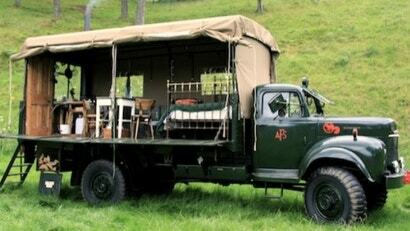 If driving up to a campsite and setting up a tent is too much "roughing it" to endure, this tent/truck chimera is just what you need to enjoy the great outdoors without sacrificing the amenities of a cabin. Walter, the creator of the Inshriach Yurt, has truly excelled himself in his seemingly never ending quest for a renovation challenge. Having liberated this 1956 Conmer Q4 from the Manston Fire Museum in Kent and wrestled it back to Inshriach House, he has quite literally raised the roof (by a foot). Then he laid an oak parquet floor rescued from a Tudor mansion, salvaged snooker table slate to make a hearth and a fire escape for a staircase. The Beer Moth now also sports a completely over the top Victorian double bed, the door from one of the (now presumably a little drafty) cottages at the farm, and the former back wall of the doghouse. The mahogany plinth has been replaced with a wood-burner, the inexplicable stuffed squirrel has vacated the premises, and the cutting edge of unusual places to stay has been an immediate hit with its first fortunate (and slightly bemused) guests.